Got a post card? Send a post card from home. “I have a special request from the USS Russell Ombudsman and from Thomas & I too. 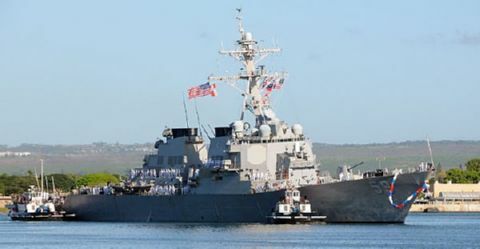 The men aboard the USS Russell have been on deployment since September and towards the end of March they were almost home to their port in Hawaii when they were turned around and sent to points unknown until time unknown. I’m sure the morale must be low at this point for most of the men since they were anxiously waiting to arrive home after being away from their families for so long, and I know from our daughter-in-law and grandchildren that the families were quite disappointed as well. So with that said, could you do us a favor and show your support? Thank you. Many of you have asked me what you can do for our Sailors. I have an assignment for you! I want you to start sending postcards to the below address. The crew is going to use them to decorate their walls then take some pictures and show us how many they received. They will post those on their Facebook page. Tell your friends and your neighbors. Email this message far and wide. Post it to your Facebook page or blast it out on Twitter. Let’s show the Sailors of USS Russell how much we love them – in postcards! I will do this . I love our service men. My heart goes out to them. I really don’t know how they do it. All the things they see and hear and then come home and are expected to act like nothing ever happened. It is our service men who should be paid for like not the crazies in Washington!!!!!!! I made a little mistake, our srevicemen should be paid for life. Not the president and the crazy polatician in Washington!!!!! Sorry!!! !